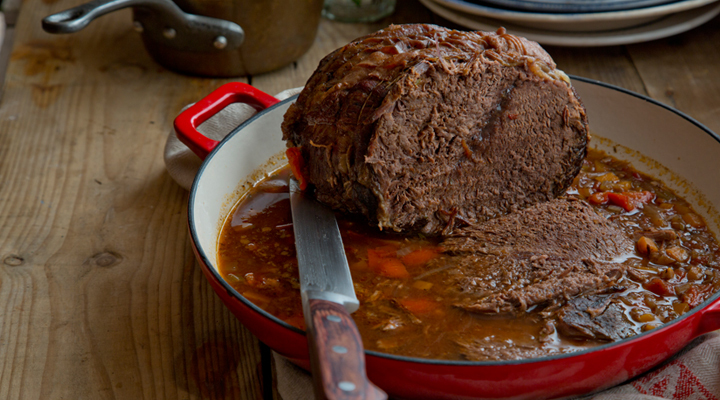 The ingredients and flavours in this dish make for a great change of scenery from the usual Sunday roast beef. It's a hearty one-pot wonder, which is easy to prepare yet sure to impress. For even more of an Italian twist, add a large handful of wild mushrooms for the last 15 minutes of the cooking time if liked. Place a casserole pot that has a tight-fitting lid over a high heat. Add 1 tablespoon of the oil and sear the beef all over for a few minutes, until golden. Remove the beef and reduce the heat a little. Add the remaining tablespoon of oil and gently sauté the onions, celery and carrot for 4 to 5 minutes, until softened. Add the garlic for the final minute. Turn the heat right up and add the wine, allowing it to bubble down while scraping any reside from the bottom of the pan, then add the peppers, tomatoes, beef stock, rosemary or thyme sprigs and salt and pepper. Return the beef to the pot, nestling it into the sauce. Bring slowly to the boil, then pop the lid on. Transfer to the oven to braise for 31/2 hours. Add the potatoes and olives, if using, halfway through the cooking time. Remove the beef from the sauce and carve into slices. Spoon the potatoes and sauce onto each plate and arrange the beef on top. Serve at once. Tip: If there are any leftovers, flake up the beef and toss it through pasta and sauce for dinner the next day. Omit the potatoes, adding 100g of pearl barley in their place, and serve with mashed potatoes, polenta mash or even pasta instead. Tried this recipe at the weekend. It was absolutely delicious. Really hearty and tasty. No leftovers! i have made this a few times now and it is absolutely gorgeous.